If you've been following the fiscal cliff negotiations, you probably know that the bill that just passed the House raises by about $650 billion taxes relative to 2012 policy, or cuts taxes by about $3.9 trillion relative to current law, plus or minus $100 billion. That's a 10-year cost, meaning that annually the change is $60 billion or about 0.5% of GDP (I think ...) . The end result is that households earning more than $450,000 will see their income tax rates rise to the rates we saw under Bill Clinton. Some of tax cuts oriented towards low-income households will stick around, at least for another year or two or five, but others, such as the payroll tax holiday, will expire. similar to our current tax rates. 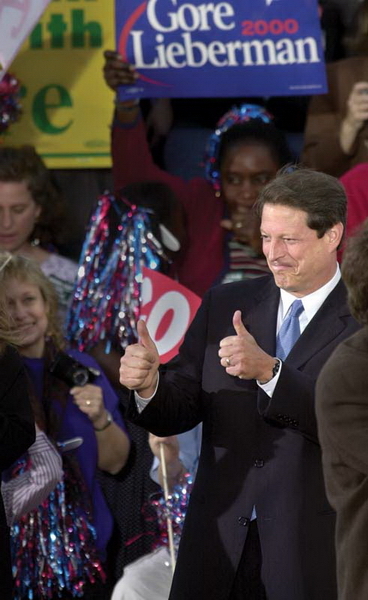 Rather than using current law or current policy as the baseline, a more useful way to compare the fiscal cliff deal is to compare to Al Gore's 2000 campaign proposals. As a candidate, the then-Vice President proposed a grab bag of tax cuts and credits, including additional relief of the "marriage penalty", credits for child/elderly relative care, college tuition, an expansion of the EITC, and so forth. Most of these credits phased out somewhere between $80,000 and $120,000 in income, or roughly $100,000 and $150,000 in today's dollars. Had Florida been allowed to complete its recount and Gore emerged victorious, he would have faced a Republican house and a 50-50 Senate. Even if Jim Jeffords defected again, we would have had budget negotiations between a Democratic President, a very conservative House minority, and a Senate that had more moderates from both parties than the current one (John Voinovich, Lincoln Chafee, Ben Nelson, Jon Breaux, Zell Miller etc.). It's easy to imagine such negotiations producing effective tax rates fairly close to what is now in place -- overall tax rates might be slightly higher, and taxes on the upper-upper middle class and cash-flow-but-not-asset rich might be at their Clinton-era levels -- but the basic shape isn't that far off what might have been. "Very Important And Difficult Work"
Behold, The Power of (Donkey) Cheese! Well ... That Was Quick! On The Filibuster Reform That Isn't, Really.